When our oldest daughter was preschool age, she was obsessed with The Nutcracker Suite. Well, let’s be honest, it was the Barbie version, but she loved it. She would dress up like a princess and dance around the house pretending that she was the star of the show. When the Nutcracker came to town for holidays, my husband asked her to go with him. They dressed in their finest; she even got put her hair in an up-do, and off they went. It was a long show. There were many in attendance, almost all older than her. While she loved being with her dad and seeing the show, she was also a preschooler so she wiggled and squirmed and squealed and giggled. She had to go to the bathroom. She got hungry and wanted snacks. But when she got home, she beamed. I asked her to tell me about it and all she could remember was the scene with The Rat King (Oooo…scary!). Surprisingly not one person commented, “Hmm, seems like a waste of money to me. I mean, did she even understand anything?” Nobody criticized us for forcing her to sit through a long performance filled with imagery and dialogue she couldn’t follow. No one complained about her fidgeting or her outbursts. And nobody questioned whether this was beneficial for her. Because everyone recognized, it wasn’t about her understanding the “story” of The Nutcracker Suite or her watching the ballet with a critical eye or even her sitting still through the performance. It was about giving her an experience, a total package, filled with sights and sounds and smells and stories that could be felt and experienced even if they couldn’t be understood or comprehended. A few years ago, a mom shared with me that the reason her kids didn’t join us in Kids Church is because every now and then she wants to them to get to experience the traditional service at church, to hear the liturgy, to listen to the hymns, to be a part of a service that replicates the services that she grew up in and that have been part of their family’s tradition. You see, for this mom, it’s not about her children understanding each word of the sermon or comprehending the history of the liturgy or the meaning of the hymns. It about the total package; the experience of being in church, surrounded by the things that have been formational for generations and by the people who make up the body of Christ. These children get to be seen, they get to see, and they get to experience church. The church experience is much bigger than a sermon. Big or little, child or adult, the sermon is only part of the whole experience. Not understanding the sermon in no way negates the rest of the experience. Seeing the people. Singing the songs. Giving our tithes and God’s offerings. Praying, at your seat or at the altar or in small groups or corporately as a whole church. Reading Scripture. Reciting psalms, hymns and spiritual songs. Smelling the incense. Tasting the communion elements. Serving. Celebrating. Fellowshipping. Communing with God and with each other. And much of what is included in that package is not comprehended through the mind, but through the heart. It’s not things that require a certain level of development but things that are experienced through the senses and understood through emotions. A sense of belonging, a place in community, an important part of a body. All of that can be experienced, regardless of age. As adults, we recognize that there is more to the church service than just the sermon. The same holds true for children too. Giving them the opportunity to experience the total package is a gift; whether they understand parts of it or not. It’s become so easy in our society to spread hate. Wow, Christina, that’s a pretty broad statement. Care to explain? The rise of the meme has been a interesting phenomenon. Over the past few years, I’ve watched the meme trend growing on social media, but in particular this past year, it has become something that has caused me deep concern. Memes are pictures or short videos that have words overlaid across them that are usually short, quippy, and intended to cause a spontaneous emotional response. Some are really funny and completely harmless. But many employ the use of sarcasm in order to make a point, like political posts or posts about social concerns. But the ones that bother me the most are the “Christian” memes. Memes that are intended to in some way shame, judge, or correct others regarding things like church attendance or Bible reading in a public and passive aggressive way. Just yesterday in a children’s ministry forum, a meme was posted of four children in church using electronic devices that basically implied if we let kids use electronic devices in church, they will never follow God and we can’t expect them too. That sentiment was expressed in a much more sarcastic and pointed tone, but that was the gist of the message. Just today someone in this group posted that they had a chance to lead a young man to Christ. That young man had come to church for three years, sat in the pew with his mother (not kids church) and played games. This Sunday after three years, he came to the children’s pastor with his mom in tears and asked how he could begin a relationship with a Jesus. My problems with memes like this one is that, while quippy and hard hitting, intended to evoke a response of righteous indignation, they leave out so much of what church actually is. What if these same kids had people in church committed to walking with them through life. What if each Sunday they were greeted by name. What if their parents recognized their kids probably wouldn’t get the same thing out of the sermon as them but still wanted their kids to experience gathering with the whole faith community. What if this picture shows just a moment and not a story. God is bigger than Mario and Pokémon. Even if we don’t agree with this behavior , our disagreement won’t bring the love and light of Christ to these young hearts. That’s up to us..the church..the community. The definition of the word hate is “intense or passionate dislike.” Meme culture has made it easy for us to express our intense passionate dislike in a short quippy statements with a funny face in the background. It’s so easy to spread hate. In fact, if we post it and people who agree with us like it, they share it too. The term we use for memes that get posted a lot is “viral.” Viral refers to a virus, like a cold. Easy to share, easy to spread. Memes can be little capsules of hate that we can spread easily like a virus. And Christians are doing it! Lots and lots and lots of “Christian” memes are out there that, at their base, use shame, sarcasm, and judgment to make a point and many times political memes, shared by Christians, do the exact same thing. We need to shake ourselves out of the stupor of the habit of hate. Of course, we may feel something is wrong and needs to be addressed, but I promise you, there are much better ways to share our hearts than a cutting statement over a picture to be passed around circles that already agree with us. We cannot expect the next generation to live into faith in Jesus if our approach is to use shame and sarcasm as motivation. Jesus came to offer a new way, a way that is founded not in hate, but in love. “A new command I give you: Love one another. As I have loved you, so you must love one another. By this everyone will know that you are my disciples, if you love one another.” (John 13:34, 35). I’ve never seen a life changed by a judgmental, sarcastic meme. I’ve seen many lives changed through the love of Jesus Christ shared through relationship and conversation and the act of laying oneself down for a friend. If we create a habit of choosing to build relationships with people, even if we disagree with them on some political persuasions or religious behaviors; if we resist the desire to “pull a punch” and hit them with our oh-so-clever one-liner; if we lay down our right to a “thumbs up” from those who already agree with us and seek instead a conversation with those who don’t…if we are willing to break with the habit of hate and pursue the way of love… then maybe, just maybe, our voice will be heard in a way that actually brings about lasting change and transformation in people’s lives, especially those of the next generation. I get it. Memes can be quite funny and they can get the point across in ways that we just wish we could. They are easy to share. They are easy to “like.” But we aren’t called to easy. We are called to seek peace and pursue it. We are called to love like Jesus. One day, our children will google us. Let’s make sure they find Love there. As many of you know, I am involved with a church plant in Lexington, Kentucky. Recently, my husband and I had a chance to sit down with our bishop and in our conversation, this phrase came up over and over again: Church is more. More than what, you might ask? Well, in this case specifically, church is more than Sunday morning. Cognitively and theoretically, I think most Christians and most ministers would agree with that statement. But a brief review of our structures, systems and focus would argue that we do tend put an unusually high demand on Sunday. Picture this: It’s Sunday at noon. Churches are sending their congregants away to a new week. Children have been picked up, crafts and lesson sheets in tow. Nurseries have been scrubbed down, sound systems turned off, and toys sanitized. In a few minutes the once bustling church grows quiet as the people resume their lives outside the walls. Maybe we already know all this, maybe not. But whether this is a reminder or a wake-up call, I urge us to consider, are we okay with these numbers? Are we satisfied that we are preparing the next generation to carry our faith forward? Are we content that as a church we are doing our best to disciple and mentor our youth and kids? My guess is most of us would say we are not okay, satisfied or content with these statistics but we may also be lost as to what to do. Lost as to what to say. Lost as to where to go. While we cannot steer the ship of culture to become something it is not, we can consider what we can do in order to bring about a real change in the culture of the church and the heart of the home. Church may never “look” the same. Sunday morning and Wednesday night may not be what it was 20 or 30 years ago. But that doesn’t mean that we must lose the next generation. Our faith is bigger than our church walls. It’s time we realize that and we engage with Christ in the everyday. A modified version of this post was first shared on this blog here. “Dr. King was a minister’s son, and I am a minister’s son as well. I can only imagine that he went to church a lot,” Wesley said, pausing to take a breath and smile. “We need to see everyone’s inner soul instead of what is on the outside. My dream is that people would stop jumping to conclusions that would lead to quick judgments of others. I have had the blessed opportunity to live in a neighborhood with people from all over the world. My children grew up playing with friends from literally every continent. Our unintentionally multicultural front yard was a rainbow of God’s creation and a incredibly unusual community of multiethnic children. More than once, we, the adults, marveled at the absolute innocence and acceptance these children bestowed upon one another. It wasn’t that they didn’t “see” color. Of course, they did. And they respected the beauty of each heritage and each nationality represented. It was just that color wasn’t the defining feature. It wasn’t what defined the person. They were more concerned with whether their friends would share a toy, play a game, laugh with them, run with them, and eat a snack with them. I remember once a fellow mom shared with me that my daughter and one of her Kenyan friends were having a discussion about hair. My daughter loved her friend’s braids. Her friend loved Naomi’s long blond hair. They both tried to help each other get the hair they wanted. Naomi told her friend to just brush and brush and her hair would be long and smooth. Of course, as adults, we know that just doesn’t work and her poor friend got so frustrated. Naomi was so confused – the brushing worked for her, why not for her friend? Of course, on the other end, Naomi couldn’t grasp the fact that her braids weren’t going to last as long as her friends and they would keep coming out. It just didn’t make sense to them. Why? Couldn’t they just see it wouldn’t work? The short answer is no. They simply couldn’t. They just saw a friend, that’s all. The long answer is, of course, they saw their differences. It was just that the differences seemed so minuscule to them that their friendship was more defining of their relationship and they just assumed their friendship would take care of the rest. Our children have the ability to see something I think we adults miss far too often. Our children see the image of God in one another. They see humanity. They see the thing that makes each of us a mirror – the reflection of the Creator. On this day, I look to my children. They have grown up in a way that allows them to live like this. I hope and pray that we don’t steal that away from them. On this Martin Luther King Day, I look to the children. The other day I was speaking with my daughter (11 years old) about our neighbors. “I really like them,” she said. “Me too! Why do you like them?” I asked. “Because when I talk, they listen to me.” she replied. It was an interesting response. From a mom’s perspective, I thought that we, her parents, did a pretty good job of listening when she talked and I never really felt like her voice went unheard, but obviously, these particular neighbors stood out to her as unusual. So I asked her about that. Her response was convicting. Her words struck me. Over the past few years, as I’ve researched and written for this blog and for classes, one theme kept coming up over and over again in regards to why young adults left the church behind when they went to college – they didn’t feel like they belonged. They felt like they belonged in children’s ministry when they were little. They felt like they belonged when they were in youth ministry as teenagers. But once they were in “big church” they felt out of place, disoriented, like strangers in a familiar place but one where they didn’t belong. This feeling or sense of not belonging could stem from many things. If the only experience that children or youth have within a church is in age-segregated ministries, then the sense of not belonging in “big church” makes sense. If children and youth do not have the opportunity to meet and interact with the larger faith community or the chance to worship with or even have their name known by the adults in the congregation, that also makes sense. But what if the kids have been in some way a part of the corporate gathering and what if their names are known by the congregation? Could it be possible that what we are missing is their voice? Is there a place in our faith community where our children and youth can talk and really be heard? Do they know that they belong? These questions, while challenging, are fair to ask. After all, Jesus tells us that we should be learning from children (Mt. 18:1-5) and that we are to welcome children (Mk. 10:13-16) but often children, even if they are included in the corporate gathering, aren’t given a chance to speak. chance to speak, until a member spoke up at the end of service and said, “Don’t forget to let the children tell us what they learned!” And we did. And they loved it. And I was struck in that moment to realize that, however unintentionally, we had created a culture where the children were expected to have a voice, to belong. I wish we could say we had done that intentionally, especially as I reflect on my daughter’s words of belonging, but I’m grateful that nevertheless it is an expected part of our church plant. That being said, I’ve served in churches of various sizes and know that space, time, and the flow of service don’t always allow for these types of promptings. Here are some ways that larger churches may want to consider creating space for the voices of children and youth to be heard. Children love to show off their artwork. If you’ve ever gone to a parent night at school, you’ll find the hallways filled with examples of student work and if you go with your child, you will need to find theirs and let them talk about it. What if in church, we created the same opportunity for conversation by displaying the kid’s artwork, not in the children’s ministry wing, but in the space frequented by the adults, thus opening the door for conversation between young and old? Churches are great at making committees. Come on, you know it’s true! What if each time a committee is created or established, a “youth” chair is automatically a part of the plan? Create a space where older youth can sit and be a part of the discussions that guide the church. Let them know their voice is a needed part of church growth and development by giving them an actual voice in those areas. Some of the greatest lessons I’ve learned have come from kids and youth. As children and youth pastors, we have the great privilege of hearing those stories, but often the other members of our congregation do not. What if we intentionally invited those kids and youth who have stories to share the opportunity to share what they’ve learned with the larger congregation? Even if it is something “we” already know? Peter tells us to “stir one another up by way of reminder” and who better to stir us up than the next generation? Ultimately, that was what made my daughter feel like she belonged. She felt heard. They listened. It was really that simple. If there is room for their voices, I believe the children and youth will speak. But that won’t do any good if we don’t listen. Truly listen with all that we have, not passively because we have to, but actively because we want to. There’s no silver bullet for reversing the trend of young adults leaving the church, but there are lots of opportunities for us to improve. Listening to our children and making space for their voice to be heard could be one really big area. Let’s give them a voice. Each year, Pew Research Center releases its top findings of the year on a variety of topics from political to social to religious. This year there was no lack of interesting findings on any of these topics, but there was one that really stood out to me as something we, as Christians, should at least be aware of. According to their findings, Muslims are projected to be the world’s fastest-growing major religious group in the decades ahead. By 2035, the number of babies born to Muslims is projected to modestly exceed births to Christians, mostly due to Muslims’ relatively young population and high fertility rates. The research talked about is looking at birth rates, so people who are born into a specific religious group, not those who actually adopt the religion as their own. The accompanying chart does not show birth rates; rather, it shows the expected increase in the number of those who adhere to a religion by percentage. In other words, the entire population of the globe is expected to increase by 32% by 2050 and the population of those who are Christian is expected to grow by 34% (just 2% more than expected population growth, so basically, it doesn’t actually grow). 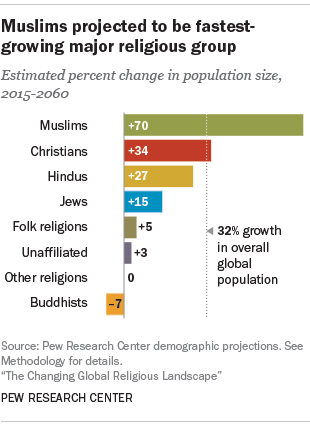 Conversely, the Muslim religion is projected to grow by 70%, greatly exceeding the expected population growth. Okay, that’s a lot of info. What does it all mean to us, Christian parents and ministers, as we approach discipleship of the next generation? I have many thoughts on this and would love to just pour them all out on this post, but that would be a lot of words and often a lot of words are just that… words. So I only want to share these few things. Now more than ever, we must recognize that we are not living in a “Christian” nation or world. We are living in a world that is beginning to explicitly reject Christianity and either remain without any religious affiliation or adopt new ones. There are people in our towns that have never heard the gospel, have never seen the inside of a church, and have never experienced the dynamics of a faith community. Our Christian jargon (words like “saved”, phrases like “born again” and concepts like “the body and blood of Christ”) sound foreign and strange, not familiar and comfortable. That is the world we are sending the next generation into and our discipleship MUST include ways for them to live in this world and still not be of it. (For more on this, check out these blogs by Carey Nieuwhof). I hesitated putting up these statistics because, sadly, I’ve seen some Christians react by badmouthing members of other religions as though these people were the enemy. They are not the enemy. Human beings are not the enemy; they are in fact the whole reason Jesus came to earth, the whole reason we are called to be the church here on earth and not whisked away to heaven, the whole reason for grace. Our heart should not be one of frustration, fear or competition – it should be love, modeled for us by God and lived out in front of our children. For God so loved the world… and so should we. These statistics, these projections, are just that… numbers and guesses. They are based on what researchers think will happen based on what has been happening. But that is not concrete. And we can change it. You see, we have the amazing gift to be able to raise up a generation who can raise up a generation who don’t walk away from the church, who choose to follow Christ, and who love this world the way that God did when He sent His Son. We have the opportunity to reverse the trends through intentional generational discipleship that welcomes children and youth into the body of Christ is ways that are tangible, communal and lasting. We can have faith-filled home where the life of Christ is lived out in the everyday and where the hope of the gospel is woven into our daily practices and conversations. We can equip parents for the work of discipleship at home. We can welcome children and youth into our faith communities. How can I say this with such confidence? Because when Jesus first came to earth, it was 0% Christian. He started with a small group of men and women who listened, learned and loved… and they shared it with others… who shared it with their children… and so on until today. Even a secular group like Pew Research Center realizes the power of the home in spiritual formation as they use birth into a family as their criteria for religious affiliation and growth. Because the future is not yet. And the present is our gift.